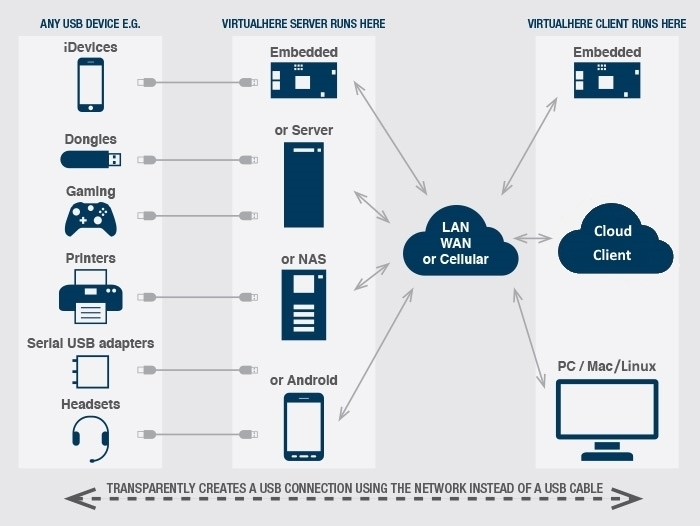 VirtualHere allows USB devices to be used remotely over a network just as if they were locally connected! Traditionally USB devices needed to be plugged directly into your computer to be used. With VirtualHere this is no longer required, the network itself becomes the cable transmitting USB signals (also known as USB over IP, USB/IP, USB over WiFi, USB over Ethernet, USB Device Server). This USB server solution is perfect for allowing USB devices to be used remotely over a LAN network, over the Internet, or in the Cloud without the USB device needing to be physically attached to remote client machine. The USB device appears as if it was directly attached even though it is plugged in to a remote server, therefore all existing drivers and software work, no special changes required. The VirtualHere USB Server software runs on the Synology, QNAP, ASUSTOR, ReadyNAS and MyCloud NAS Devices, as well as Raspberry Pi, AMD64, x86, MIPS, ARM, PowerPC, ARM64 etc running ANY version of Linux, and now runs on OSX, Android and Windows. Also, now available on the Steam Link game system! NEW: The VirtualHere Client and Server now support EasyFind so you can easily connect from anywhere, no network configuration or information needed!